This is a tremendously simple pasta dish that requires very little cooking on your part. If you can’t get this right, then you really shouldn’t be alive should you? You’ll be making your own chilli oil which you can use to spice up all manner of things. It’s perfect for this pasta dish. Combine the chilli flakes with the oil. Heat in a saucepan over a medium heat. When hot, reduce the heat to low and and cook it for 15 minutes. Remove from the heat. Leave to cool for 2 hours. Decant to a small airtight bottle. It’ll keep for ages! Cook the pasta in a large pan of well salted boiling water according to the instructions. Generally anywhere from 7-10 minutes. Combine the chilli oil, parsley, lemon juice, 2 teaspoons of the zest and pepper in a bowl. When the pasta is ready, drain, reserving a cup of the cooking liquid. 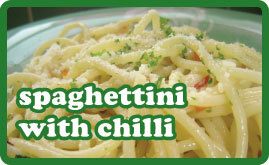 Return the pasta to the pan, pour in the chilli mix and 1/2 cup of the cooking liquid and toss the pasta well. Add more liquid if needed. Sprinkle over a little chilli flakes, the remaining lemon zest and some freshly grated parmesan.